http://www.UnderThePuppet.com – Thom Fountain was the puppeteer of Salem the Cat on Sabrina The Teenage Witch for seven seasons. He’s an Emmy nominated performer who’s also worked on Men In Black, Team America, Muppets Tonight and more. In this interview. 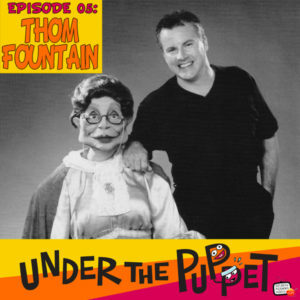 I talk to Thom about his career including his start in live shows for Sid & Marty Krofft, his thoughts on what skills puppeteers should study, his favorite puppeteer and more. Also on the show, the next step of your Puppeteer Action Plan, a small action you can take today to help your puppetry career grow.